Update, 8 p.m., Dec. 20: In a statement, Toll Brothers said it will meet its contractual obligations with Penn State on the Whitehall Road site, but remains interested in the proposed alternate site on West College Avenue. "Toll Brothers is bound by, and will meet, the contractual obligations on the Whitehall site with Penn State. We are, however, interested in the West College Avenue parcel, believe it is a viable site and have submitted an offer to Penn State. We are committed to continued dialog regarding the matter." The Nittany Valley Water Coalition says it intends to sue Penn State if the university closes on the sale of 43.5 acres of land near the intersection of Whitehall Road and Blue Course Drive to real estate developer Toll Brothers. The group, which is in the process of incorporating as the nonprofit Nittany Valley Environmental Coalition, said on Tuesday it will ask a court to review Penn State's nonprofit and public private/status, property tax exemptions and obligations related to the state's natural resources if the university does not negotiate with Toll Brothers an alternate site for the developer's planned 264-unit luxury student housing complex called The Cottages. Penn State entered a contract in 2012 to sell the land to Toll Brothers for $13.5 million, contingent on approved use of the land by Ferguson Township. That approval came in late 2015 and spurred nearly two years of legal battles and protests by the coalition and its supporters, who say that stormwater and construction runoff would harm Slab Cabin Run and the nearby Harter-Thomas well fields, the source of drinking water for the majority of homes served by the State College Borough Water Authority, which provides water to the Centre Region. Toll Brothers and Penn State said the site has undergone extensive testing and that the development plans meet or exceed local and state stormwater management regulations. A victory for the coalition in the Centre County Court of Common Pleas was overturned by Commonwealth Court earlier this year, and in November the state Supreme Court denied the residents' petition for appeal. During the summer and early fall protestors camped out on the site before being evicted by the university in October. Members of the coalition, meanwhile, entered into talks with Toll Brothers and Penn State over potential alternate sites and in November, after two months of site study, the developer sent the university a letter of intent for its interest in a 19-acre parcel on West College Avenue near the Penn State Blue Course. It doesn't look like that "land swap" will be happening. 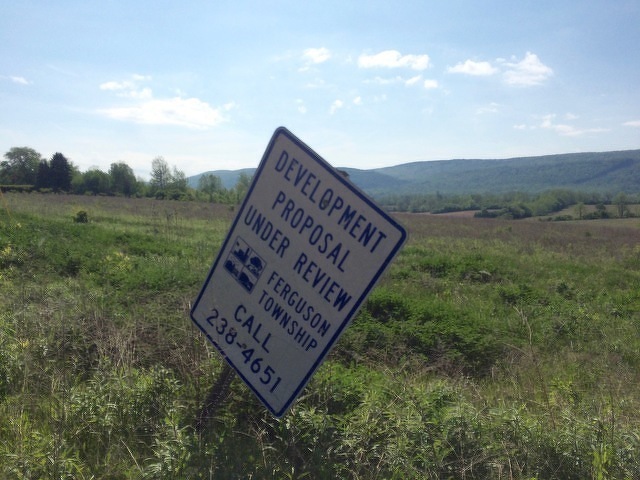 The coalition says it proposed mediation with Toll Brothers, Ferguson Township and Penn State to work out the details of zoning and land use. Penn State has refused to participate, according to the coalition. "Although Toll Brothers and the Nittany Valley Water Coalition discussed possible alternate sites for Toll’s planned development in August, only an unsigned letter of intent was sent by Toll to Penn State regarding the West College Avenue property [in November]," the university said in a statement to StateCollege.com last week. "Since that time, no additional information has been provided regarding the development plans and related impacts and there have been no formal discussions or negotiations with Toll Brothers on the West College parcel." The agreement for the Whitehall Road property sale remains in place and "the ball is in the developer’s court regarding the closing on that parcel," the statement said. A Penn State spokesperson declined to answer when the property is scheduled to close. The coalition said in a press release that it believes it will close by the end of December or early next year. In a statement provided after this story's initial publication, Toll Brothers said it will meet its contractual obligations with Penn State but remains interested in the West College Avenue site. "Toll Brothers is bound by, and will meet, the contractual obligations on the Whitehall site with Penn State," the statement said. 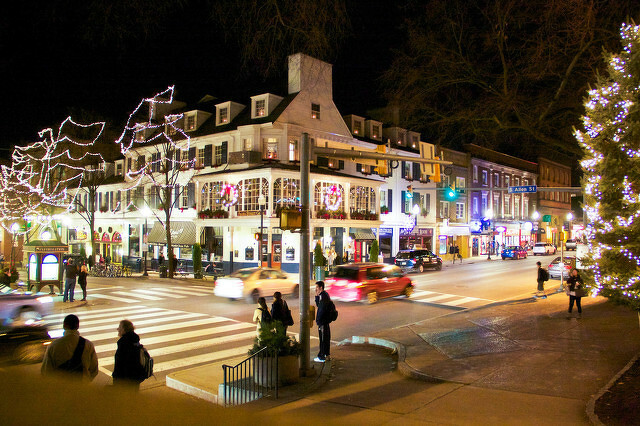 "We are, however, interested in the West College Avenue parcel, believe it is a viable site and have submitted an offer to Penn State. We are committed to continued dialog regarding the matter." The lawsuit against Penn State, if it happens, would be a constitutional challenge, not a regulatory challenge under the Municipalities Planning Code, as the previous legal action was. It would ask the court to rule that Penn State is a trustee of the Commonwealth with fiduciary obligations to protect public resources under the state's 1971 Environmental Rights Act. The coalition cited a state Supreme Court ruling this year which found the act "created an enforceable trust imposing a fiduciary duty on all Commonwealth state and local agencies to protect public natural resources." If a court were to rule that Penn State is not a state agency with those obligations and has "transformed itself from a public land grant institution into a fully private, non-governmental corporation," the coalition would ask that the university be stripped of its tax exemptions and public subsidies. What that would mean remains to be seen. The university operates in a hybrid mode as a state-related university, meaning it receives state appropriations, but is not owned or fully controlled by the state. The issue of appropriations aside, private universities also generally do not pay income or property taxes and instead, like Penn State, often negotiate payments in lieu of taxes (PILOT) agreements with local governing bodies. The coalition says Penn State has become a for-profit corporation. "We’ll be striking at the root of Penn State's hybrid legal status that has allowed it to become a tax-exempt, publicly-subsidized, privately-governed, for-profit corporation,” said coalition President Kelli Hoover, a Ferguson Township resident and an entomology professor at Penn State. The coalition cites two cases that members say suggest Penn State's status has changed over the years. They say a 1992 case between the university and Centre County and a 1999 case involving the university and Hershey Medical Center against Derry Township School District and Dauphin County both called into question whether Penn State was still a Commonwealth agency. In the latter case, the Supreme Court said the university was not "an instrumentality of the state" and the medical center was not a public property. A county court, meanwhile, ruled neither the university nor medical center qualified under the "purely public charity" immunity. The coalition said it believes that after that Penn State entered into PILOT agreements with governing authorities around the state. She added that the coalition believes the Whitehall Road land deal exemplifies Penn State's "record of buying ecologically-sensitive farmland at artificially low prices (or accepting land donations), holding the land as tax-exempt while upzoning to increase its sales value, and then selling it for massive profit and risky development." Coalition Vice President Katherine Watt said Penn State's status allows it to escape the accountability to which both public and private institutions would be subjected. “As a quasi-public, quasi-private corporation, it evades both public accountability through public elections of trustees, transparent, due-process decision procedures, and compliance with state Right to Know and ethics laws, and private corporate accountability through share issues, purchase and sale of shares by shareholders, and shareholder elections of governing directors,” Watt said.